Murder trials and movies about New York’s Italian mafia have long publicized the colorful nicknames mobsters call themselves. If our Great Dane puppy Luna was part of one of New York’s mob families, she’d sport some kind of nickname, as would her male relatives. What Kind of Mob Nickname? Baby Shacks, Baby Fat Larry, Tony Bagels, Vinny Carwash, The Claw, Johnny Bandana, Junior Lollipops, and Jimmy Gooch. Note: Billy Crystal milked nicknames in a funny scene in the 1999 movie Analyze This. What sent me thinking about mob nicknames is a meeting yesterday with one of Luna’s uncles. Uncle Basil is a brother of Luna’s mama. 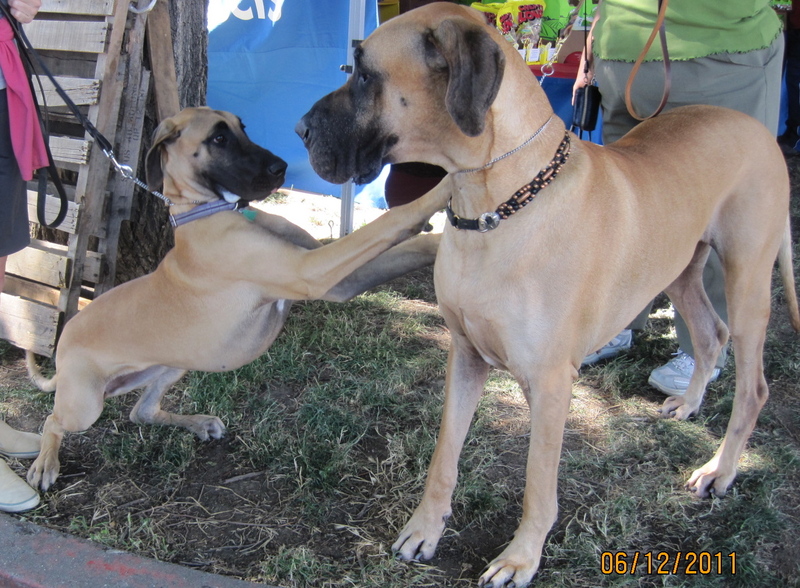 B2 picked him up to get his heart analyzed at a mobile heart clinic set up at the Woofstock dog show in Vallejo. They both stopped by our house en route to the show. It was a bit of a checkup/in-home visit after our behavioral assessment with her two weeks ago. As Sarah Palin would say, Basil is unflippinbelievably huge. He’s a beast. 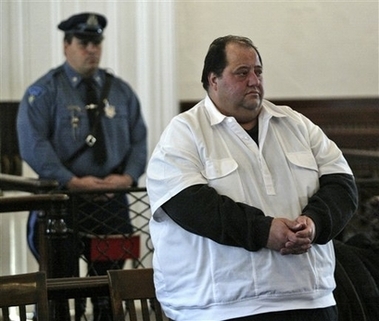 Not as big as Boston mobster Carmen “The Big Cheese” DiNunzio, who was arrested in 2006 for a succession of criminal acts unrelated to his public profile as a cheese shop proprietor, but Uncle B’s on the far, far side of full grown for a Great Dane. For all his size, Basil is a very docile 190 pounder with a muscular neck like Mike Tyson sported while heavyweight boxing champion. 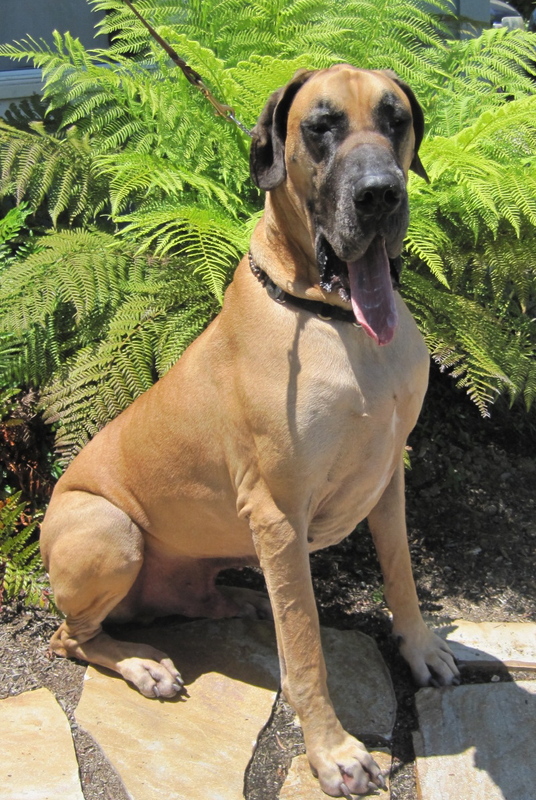 Huge muscles notwithstanding, life as a dog show champion trained obedience into his ample brain so he is easy to handle. To put their size difference in perspective, Luna weighs about 73 lb. She’s big to most people until she stands alongside a really big dog. After our house visit, we met up again at the dog show, where Luna got her first choke collar and another chance to play with her extended family. For all of the shoving and incitement-to-play Luna tried, Uncle B remained positively stoic. Any ideas for other nicknames?